Graduate students tour Agronomy Center for Research and Education (ACRE) as part of the Borlaug Institute on Global Food Security. Photo by Vincent Walter. Marlon Ac-Pangán, a graduate student at the University of Illinois at Urbana-Champaign, points to a smiling image on the screen of a 9-year-old Guatemalan boy of Mayan ancestry at Purdue’s Discovery Park. The boy is holding a spoon between his grinning lips. In his lap, rests a brightly-colored yellow bowl containing black beans and a corn tortilla. Listening intently in the room are 40 domestic and international graduate students from universities around the U.S. attending the Borlaug Summer Institute, a two-week seminar tasked with helping graduate students gain a holistic understanding of the challenges around global food security. Each of the students sits ready to propose solutions to address food-security-related problems in countries, such as Bangladesh, Uganda, Nigeria, Niger, Guatemala, Ethiopia, and Peru. According to the Food and Agricultural Organization of the United Nations, almost a billion people around the world are malnourished — about 16 percent of the population in developing countries. Food insecurity arises from reasons such as war, poverty, and climate change. 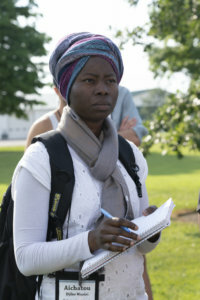 Aichatou Djibo Waziri takes notes on a tour at Agronomy Center for Research and Education (ACRE). Photo by Vincent Walter. In Guatemala, a country the size of Indiana, with a population of 17 million, almost half of the children under the age of five are chronically malnourished. The country harbors one of the sixth-highest malnutrition and stunting rates in the world. More than half of the country lives in poverty, while 23 percent live in extreme poverty — less than $1.25 per day. Many of its citizens currently are fleeing the country to seek asylum due to violence and lack of opportunity from within, brought on by historical, political instability, a situation similar to its neighbors, Honduras and El Salvador. Ac-Pangán is researching the processing capacity for small farmers in rural areas of Guatemala. He is part of an eight-person team of plant geneticists, nutritionists and anthropologists called “Ramón,” named after an indigenous nut that they propose could help tackle malnutrition, hunger and poverty in the Northern Guatemalan region of Petén. The Ramón tree nearly faced local extinction until nonprofit organizations began working hard to bring the nut and its potential for livelihood back to the region. Only five percent of remaining Ramón trees stand in Guatemala, the remnants of ancient Mayan orchards, built to protect against famine in drought years and well-adapted to the region’s erosive soils. There is hope in the tree nut. Similar to cashew and a relative to the fig tree, the nut can be processed into a flour and used as an alternative to corn when crops are poor, for making tortillas, bread, pastries, and a chicory-like coffee substitute. It can be used even as a medicinal treatment for asthma. The gluten-free flour contains more protein than corn and is rich in micronutrients such as zinc to fight malnutrition-related stunting. Improving the quality and efficiency in processing the nut for international export should help to enrich the local economy and improve nutrition and wages for indigenous groups who face discrimination in Guatemala. Other proposed projects include an app to leverage existing smartphone technology to help farmers efficiently bring tomatoes to market in Nigeria. In Niger, where 70 percent of its population is under the age of 25, students proposed increasing the production of West Africa’s oldest and fastest growing cereal grain in the world – fonio – to alleviate poverty and malnutrition in women and children. In Uganda, in the Arua district, near the South Sudan border and host to the world’s largest refugee camp – Bidi Bidi – students proposed the production of a leafy green called Amaranthus dubious to tackle food insecurity in the region for surplus during lean times of the year. 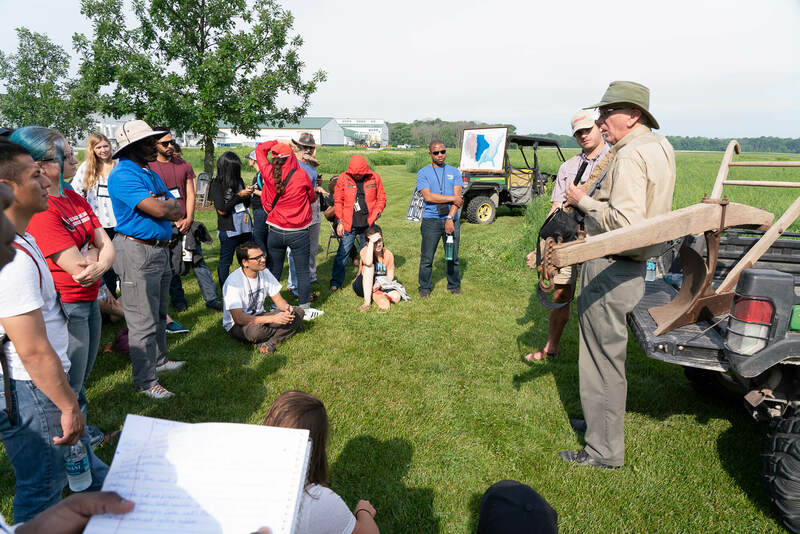 A $5 million USAID grant supported the U.S. Borlaug Summer Institute on Global Food Security at Purdue for the past six years, training 255 graduate students from 65 universities and providing 149 graduate student fellowships. “It amazes me how quickly they pick up the nuances we have shared and put it all together in some package or solution,” Ejeta says.